One of the biggest factors critical to the long-term health of your business is using the right ERP system. So, of course, choosing that system is a decision worthy of a systematic process to narrow down and carefully audit your options. In this guide, we explain how to decide which ERP system best fits the needs of your company. Learn how to evaluate ERP systems to determine which one best fits your needs by downloading this free guide today. Selecting an ERP system for your business can be challenging. Each supplier will proclaim the superiority of its products, making each platform seem like the perfect choice for you. Don’t be fooled! There’s a smarter way to evaluate ERP systems to help you make the choice that best suits the needs of your business. In this guide, we give you 10 tips you can employ to help your company make a smarter ERP selection. 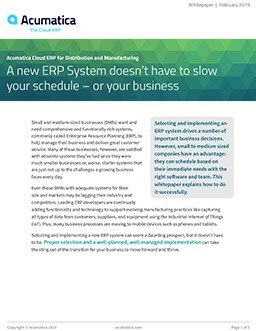 Discover what these 10 tips mean and make a smarter ERP system selection by downloading this free guide today. These two guides provide tips and advice to assist you in making the best possible choice of ERP system to meet the needs of your specific business. Move past the flashy and new claims made by the ERP system supplier to discover the features you really need. Have further questions about evaluating ERP systems for your business? Let us know in the comments and we’ll do our best to answer them.